The Kurds of northern Iraq are crucial to the U.S.’s anti-ISIS efforts, and are finally receiving direct aid from the Pentagon. But they are increasingly concerned that their sacrifices will be forgotten by Washington. There’s something strange about an American-made Iraqi army tank flying the flag of devoted Shia imams. That apparition came rumbling out of the dust near a village called Kanhash on October 22 as I watched the Iraqi army prepare to retake Mosul from ISIS. How an American tank ended up festooned with a Shia flag is emblematic of Iraq’s tortured history. The U.S. fought two wars against Saddam Hussein. It has had almost 36 years of terrible relations with Iran that consist primarily of Iranian mullahs chanting “death to America” while crowds stomp on American flags. This has been punctuated by hostage-taking and the kidnapping of American citizens to be used as bargaining chips. Today, on the frontline of the war against ISIS, the Iraqi army, once the instrument of repression and genocide by Saddam Hussein, is staffed by Shia soldiers, many of them sympathetic toward Iran, riding American MA1A1 tanks. Such are the complexities of war, cynical U.S. strategists might say. The necessity of defeating ISIS means working with all those who fight extremism. But the rebuilt Iraqi army is not a result of expediency. It is part of $60 billion spent on rebuilding Iraq since 2003, which is, in turn, part of the $1.7 trillion spent on Iraq since 2003. As Iraq’s war against ISIS enters its final ground phase, many are asking what will come next. Could a new round of conflict be ignited between the Iranian-backed militias in Baghdad and the autonomous Kurdistan Regional Government (KRG) in northern Iraq? Will Sunni Arabs accept permanent political stagnation and irrelevance at the hands of a chauvinist Shia-dominated parliament? Will minority Assyrian Christians, Yazidis, and others be able to return to their homes destroyed by ISIS and reestablish their communities? At the heart of this question is the role of the Kurds and the KRG, which have been at the forefront of the war on ISIS. On October 22, the Iraqi parliament banned the sale and import of alcohol, joining countries such as Saudi Arabia in its prohibitive proclivities. In northern Iraq, the Kurdish government said the law would not apply to them. I thought about that as I meandered through five layers of security at the KRG’s international airport with two miniature bottles of Johnny Walker Black Label. Alcohol by itself isn’t some great achievement of liberal democracy, but banning it is part of a religious crusade to control morality. When I went out with several Kurdish friends in Erbil—the de facto capital of the KRG—they said that allowing alcohol sales was an important part of their orientation towards the West and liberal democracy. It wasn’t about the sales per se. Most Kurdish restaurants don’t sell alcohol and it is almost exclusively available in Yazidi and Christian areas. It is about what it means: protecting minorities, defending civil rights, fostering a more open-minded conception of a Middle East that can accept diversity. It is for these values and to defend their homeland that Kurds have been fighting ISIS for two years. Now many Kurds wonder if their sacrifices will be remembered. They worry that they have been used as a shield by the U.S.-led coalition, part of the cynical diplomacy of realpolitik, and sent like cannon fodder into battle only to be forgotten when it is over. They’ve been abandoned before, and as the saying always goes in Kurdish regions, “We have no friends but the mountains.” In the days when that saying made sense, this region consisted largely of little more than mountains. But today Kurdistan glistens with new malls, large cities such as Dohuk, and construction projects only put on hold because of the war with ISIS. One hundred years ago, the European powers fighting World War I decided to divide the Kurdish regions of the Ottoman Empire into French and British spheres of influence. Now, the Kurds have much more to lose. On the surface, everything seems to be going well in the KRG when it comes to foreign support. In April, the U.S. agreed to support the Peshmerga, the KRG’s armed forces, to the tune of $415 million. This was to plug the gap created by an ongoing economic crisis in the Kurdish region. The collapse of the price of oil has cut deeply into the Kurdish budget and the cost of two years of war has taken its toll. The need to support hundreds of thousands of men rotating in and out of 1,000 kilometers (620 miles) of frontline positions would hurt any small country, let alone the Kurdish region, which has only eight million inhabitants and has been forced to shoulder the burden of caring for 1.5 million refugees who fled ISIS and are housed in refugee camps throughout the area. The U.S. went one step further in July, sending assistant Secretary of Defense Elissa Slotkin to sign a unique agreement with the KRG to continue funding the Peshmerga. Normally, all funding for the Kurdish region would have to go through Baghdad, just as foreign aid for Egypt would go through Cairo, but the Americans recognize that Baghdad has continually withheld funds from the KRG under the excuse that it too is fighting a difficult war against ISIS. The Kurds are supposed to receive 17 percent of the federal budget, but arguments about oil exports (the KRG has attempted to export oil on its own) and the war effort have frustrated these agreements. After the signing of the July deal, KRG spokesman Safeen Dizayee told ARA News that the agreement was “a recognition, appreciation, and value of Peshmergas’ sacrifices, and a contribution to stability and defense of liberty, democracy, and humanity.” These are grand values and concepts, but for the U.S. the agreement is more pragmatic. Hilary Clinton said during her second debate with Donald Trump that “I would consider arming the Kurds; they have been our best partners in Syria as well as Iraq.” Her comment related to Syrian Kurds, but the “partners” comment is an important indicator of her recognition of their role in Iraq. The question is whether that partnership is temporary and military-based, or deeper and values-based, as Dizayee and many Kurds would like it to be. The U.S. government has stepped up its support of the Kurds in recent months, but will soon be winding it down again. The Obama administration wants the war with ISIS concluded by the time it leaves office. Secretary of Defense Ashton Carter has prodded the Iraqi government and KRG to work more closely on the current offensive to capture Mosul, and the Defense Department has played a key—and successful—role in cultivating relations with the Kurds in Syria to continue to roll back the extremists. The Americans have certainly stepped up relations with the Kurds on the military-to-military level. I visited the Bnaslawa base of the Kurdistan Training Coordination Center in July and saw how seven members of the U.S.-led coalition were training Kurds in small unit infantry tactics. In December 2015, Col. Bernd Prill told reporters they could produce 8,000 trained soldiers in 25 day courses. The reality took a little longer, but by July 2016 two Kurdish brigades had been outfitted and around 80 Humvees, 50 mine-resistant vehicles, and 15 mine rollers had been provided. 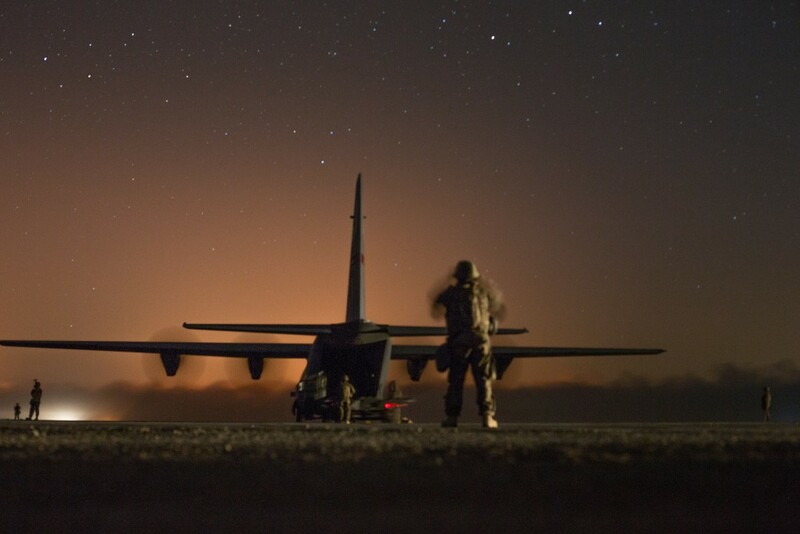 The idea was to pair this “build partner capacity” program with the “advise and assist” program on the ground, which consisted of artillery and air support for Kurds as well as special forces embedded along the Kurdish lines. 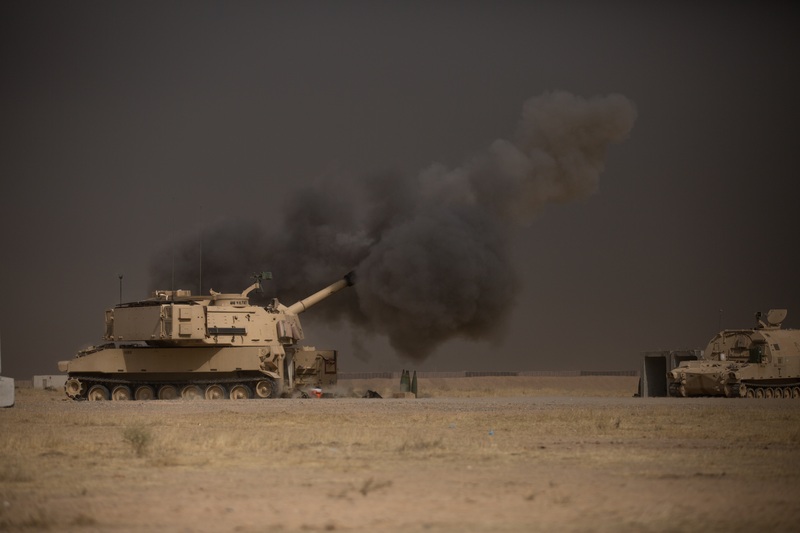 The increase in support under the umbrella of the U.S.-led Combined Joint Task Force, part of Operation Inherent Resolve, is clear on the frontlines of the Mosul offensive, which was launched on October 17. I returned to the KRG on October 20 and immediately drove to the frontline at Bashiqa, where Kurdish forces were starting a major push to liberate towns and villages around 14 kilometers (8.5 miles) from Mosul. American and other special forces were present along the line. At one position a Peshmerga soldier pointed to a sniper and observation team monitoring ISIS movements below us. Nearby, a small basecamp for foreign forces was off-limits, but was festooned with the satellite dishes and other modern equipment that no Kurdish camp would have. Coalition artillery and airstrikes were pounding the enemy a few kilometers away with extraordinary regularity. An air campaign that usually involves 10 strikes a day had been upped to 60 or more. On the ground with the Peshmerga, it was clear some of the foreign equipment had trickled down to elite units, such as the Zerevani division. One Peshmerga soldier with an AT4, a pipe-like anti-tank missile that fires one shot and is then disposed of, lay resting by the side of the road after a tough day’s battle at Nawaran, 20 kilometers (12.5 miles) east of Mosul. But the reality was that the legions of Peshmerga fighting on the Nawaran-Bashiqa line were fighting with AK-47s, uniforms they brought from home, and only the occasional heavy weapon. Humvees that the better units had were often unarmored and of mixed pedigree; some had been captured from ISIS after ISIS captured them from the Iraqi army that abandoned Mosul in June 2014. Among Kurds this used to be a kind of joke about U.S. supplies: If you want U.S. equipment, don’t ask the Iraqis, just capture the U.S. equipment from ISIS, which captured it from the Iraqis. The Peshmerga role in fighting ISIS is coming to an end. Under an U.S.-brokered agreement with KRG President Massoud Barzani, Mosul will be liberated by the Iraqi army. Three units of that army, the 16th division, the 9th armored, and the elite Iraqi Counter-Terrorism Forces, were transported north to Kurdish lines in early October. The last 10 kilometers of the road to Mosul have been assigned to the Iraqis, while the Kurds consolidate their control of hard-won areas in the Nineveh plains, such as Bashiqa. For months, the Kurds had been saying they would like to enter at least the eastern suburbs of Mosul, where many Kurds lived before 2014. Mosul was a strategic position for Saddam Hussein before 2003 and after that a center of jihadist extremism. In 2004 and 2007-2009 there were numerous terror attacks on Kurds, Shabak, Yazidi, and Assyrians in the city. For Kurds, Mosul is a strategic security threat and a historic city with Kurdish connections. As the door closes on ISIS in Iraq, Kurds worry about whether their sacrifices will be remembered. Barzani and his administration have continually stressed the importance of planning for post-liberation Mosul. There have been many meetings between Iraqi and Kurdish leaders, with U.S. officials such as Brett McGurk, the Special Presidential Envoy for the Global Coalition to Counter ISIL, in the room to show support. But none of the concrete problems seem to have been ironed out. 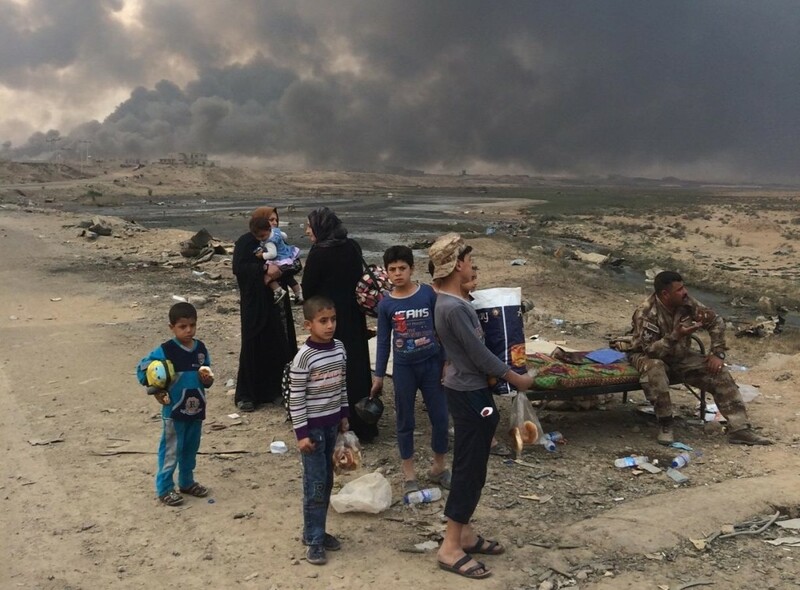 Everything in Iraq is tied to history, something that is not always readily apparent to Western policymakers, who tend to be solution-driven, with each “crisis” occurring in a vacuum. Salahaddin University Professor Abdulhakeem Khasro traces the current complexity in northern Iraq and Mosul back to the 1950s, when the city was a source of Arab nationalism. It is largely forgotten now, but in 1959 Mosul was a center of a short-lived nationalist coup. In the 1970s and 1980s Saddam Hussein began a campaign of Arabization in the region of Nineveh and Sinjar, removing Kurds and Yazidis and moving Arab tribes into their villages. Major demographic changes took place even before he embarked on the genocidal Anfal campaign against the Kurds, which infamously including the use of poison gas. Villages were bulldozed and communities were sent to collective camps. The landscape of Nineveh, which is an ancient area with a diverse mosaic of peoples, was changed under Saddam. This ethnic cleansing is not forgotten. Kurds see Nineveh and Sinjar as “disputed” areas with Baghdad over which the KRG should have control. The war with ISIS accelerated this reality. ISIS cleansed all the Christians from Nineveh and committed genocide against Yazidis, driving hundreds of thousands into refugee camps and committing unspeakable atrocities against Yazidi women. In a sense, the extremes of Sunni jihadism—ethnic cleansing, genocide, and destruction of archaeological and religious sites of others—was an outgrowth of Saddam-era policies. Kurds were victims of both. However, the Kurdish resistance to ISIS has led them to liberate these disputed areas and the KRG would like to cement its control over them. Minority communities know that the Peshmerga are their best defenders against extremists, and most minorities now have their own armed militias, such as the Nineveh Plains Forces, an Assyrian unit. Mosul is the new key to the Middle East. Mosul connects to all the competing interests in a way that the ISIS capital in Raqqa, Syria does not. It is the keystone of northern Iraq, and at the heart of a dispute between Turkey and Iraq and therefore Turkey and Iran. The Kurds are in the middle of this dispute, and they risk being used by Sunni powers as a shield against Iranian influence. This is an ironic position for Kurds to be in, because for generations it was Sunni Arab powers like Saudi Arabia that opposed their independence. Now the situation is reversed: Some of their friends were previously their worst enemies, and old friends like Iran are now seen as an enemy. Kurds, who were once always seeking refuge are now hosting millions of refugees. Some Kurds see this as another threat. A million Arab refugees in the Kurdish region dilutes their demography and accomplishes in a roundabout way the Arabization that Saddam wanted. But some of those Arabs are new allies: Saddam-era officers now serve in the militia of Atheel Nujaifi, the exiled former governor now supported by the Kurds. The Kurdish region is also divided in its own politics. The Kurdistan Democratic Party (KDP) has been in charge in Erbil throughout the war with ISIS, and it has been the face of Kurdistan abroad. But the Patriotic Union of Kurdistan (PUK), historically the other major Kurdish party in Iraq, has played a key role in the war and its soldiers have served side by side with the KDP. The PUK has better relations with Iran than the KDP, as does the Gorran party, another large party in the KDP parliament. The Kurdistan Workers Party (PKK) has bases in the region as well, a fact that has led Turkey to claim that it might intervene in Sinjar. But with the possible exception of the small Islamist parties in Kurdistan, the trend among all the major parties is support for a more tolerant and open-minded society than is generally found in neighboring areas. Whereas much of the Middle East is trending towards increased sectarianism and religiosity, the Kurdish region is a reflection of more democratic and diverse values. The war on ISIS has brought those values to the forefront in some ways, as Kurds stress their defense of minorities and women’s rights against the fanatics. But it has also postponed plans for independence and deeply harmed the economy. The international community’s support for Kurdistan has generally been part of an anti-ISIS coalition. But an emboldened Iraqi central government, fresh from successes in battle and with support from Iran, might try to roll back Kurdish gains. Just one lumbering U.S.-made battle tank is a military threat in the hands of a militia that seeks to use them against Kurds. The Obama administration made reduction of U.S. influence a centerpiece of its policy in the world, and its policymakers eschewed basing U.S. policies on shared values, preferring pragmatic diplomacy such as the Iran nuclear deal. The Kurds have been fighting and dying against extremism; the question is whether the next U.S. administration will forget their role or stand by them. That may include supporting independence when the Kurds choose to move towards it.